A bright and cheerful orange bouquet of lilies roses and gerberas combined with stylish foliage. This hamper will earn you 102 Hamper Points. Image displayed is of medium size option. 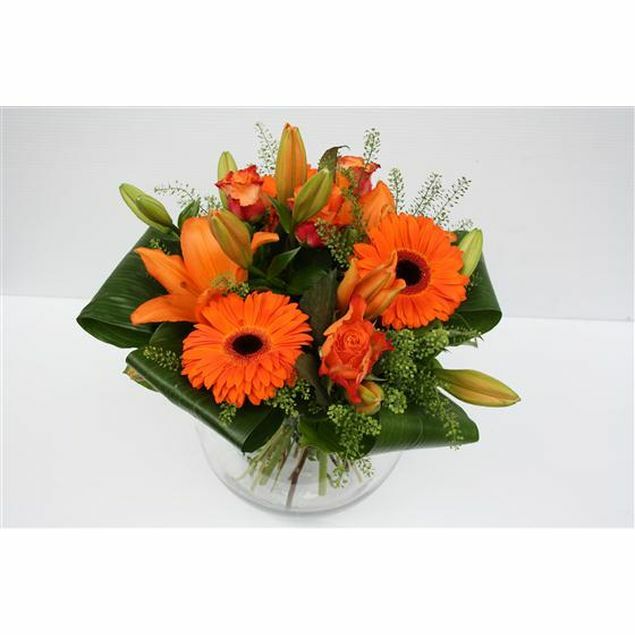 This flower arrangement is aqua packed delivered in water for instant displayed. Please note that due to the seasonal availability of flowers it may be necessary to vary individual stems from those shown. Our skilled florists may substitute flowers for one similar in style, quality and value. Where our designs include a sundry item like a vase or basket it may not always be possible to include the exact item as displayed. If such an occasion arises we will make every effort to replace the item with a suitable alternative.